Andy Peaks believes there are still areas that could do with improvement in his AFC Rushden & Diamonds squad, even though their incredible unbeaten run continued this week. 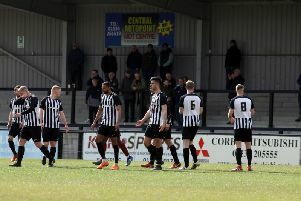 Diamonds made it 19 games without defeat in the Evo-Stik Northern Premier League Division One South as they fought back from a goal down to claim a dramatic 2-1 victory at Bedworth United on Bank Holiday Monday. Substitute Tom Lorraine drew Diamonds level with 12 minutes to go before Fazel Koriya won it in stoppage-time. The victory kept Peaks’ team in the play-off places and ensured they still haven’t been beaten in the league since Chasetown won 3-1 at the Dog & Duck way back on August 16. Diamonds have no game this weekend but will have the chance to make it 20 league matches without a loss when they host Kidsgrove Athletic a week on Saturday (January 14). But Peaks is still keen for more from his in-form team. “I am happy with where we are,” he said. “We are not the finished article and we still have weaknesses that need to be strengthened. “When you go on a run of 19 league matches without defeat, it’s pretty clear that you are doing something right. “But every manager always strives to be better and I am no different. “We have no game on Saturday so we have to see where we are after that but we have put ourselves in a good position. “If we can replicate the form we have shown in the first half of the season then we will be in and around the play-off places and that is the aim. “We need to improve our home form, we need to be winning more games at home. Diamonds return to action next Tuesday night when they head to league rivals Rugby Town in the second round of the Integro League Cup. And while Peaks is keen to maintain the momentum, he revealed he may make changes. “It’s important we give some minutes to those players who need them,” he added.